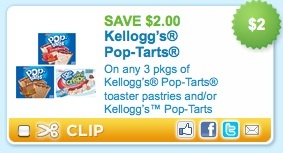 Home > Printable Coupons > Kellogg’s Pop Tarts Coupons! Hurry and print an awesome new Pop Tarts coupon! This won’t last long. I am sitting down to get coupons together for a Kroger trip so this is perfect with Pop Tarts being part of the mega event this week! It will make the 12ct. boxes $1.73 after coupons!! Not a Kroger shopper, I’d still print the coupon while you can and save it for another sale.